I have friends who have been waiting nearly three decades for a successor to the Roland Jupiter 8. Their hearts went all a‑flutter when 1991's JD800 was announced but, while this is now a minor classic in its own right, it wasn't what they had envisaged. They went through the same set of emotions when the JP8000 appeared in 1997, only to be disappointed again. But now there's a synth that says to the world, "Let there be no confusion; I am a Roland Jupiter”. Launched amid a flurry of speculation, praise and diatribes in equal measure from people who had never been within 100 miles of one, let alone heard one, it's the Jupiter 80. 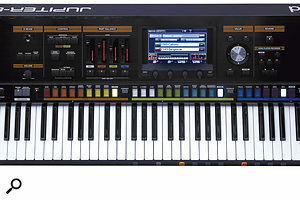 Physically, it's somewhat larger and heavier than Roland's most recent and now discontinued 76‑note workstation, the Fantom G7. Its colourful control panel is reminiscent of a Jupiter 8, but only in a superficial way, and it's clear even before switching it on that most of the action is going to take place on the 800 x 480-pixel touchscreen that dominates its control panel. The touchscreen is good news; I've lost track of the number of times I've poked a Fantom's display in the expectation that something will happen. 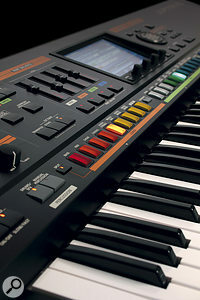 The Jupiter 80 generates its sounds using the Supernatural technology first heard on the ARX boards introduced for the Fantom G series, married to a significantly cut‑down version of the APS (Articulative Phrase Synthesis) technology found in the V‑Synth GT. However, despite the justified clamour from Fantom owners, there are only three ARX boards (one each for drums, electric pianos and brass), and the set of polyphonic APS sounds in the Jupiter 80 does not overlap fully with the APS sources and Phrase Models in the GT, so it's clear from the outset that the new synth is not simply a mélange of existing engines presented in a colourful new box. What's even more apparent is that the Jupiter 80 is not based on any conventional synth architecture, because it eschews the conventional patch and performance structures that have dominated synth architectures for the past 20 years or so. The lowest level (or so Roland claims) is the 'Tone', and there are two distinct Tone generators: Supernatural Acoustic (which, confusingly, also contains the APS sounds) and Supernatural Synth. The next level up is the 'Live Set', which can comprise up to four Tones in 'Layers'. The top level is the 'Registration', which comprises four 'Parts': a single Tone in the Perc Part, a Live Set in the Lower Part, another Live Set in the Upper Part, and another Tone in the Solo Part. Confused? I'm not surprised; so was I. But I have to admit that, by the end of the review, I found it simple to use, if rather unusual. 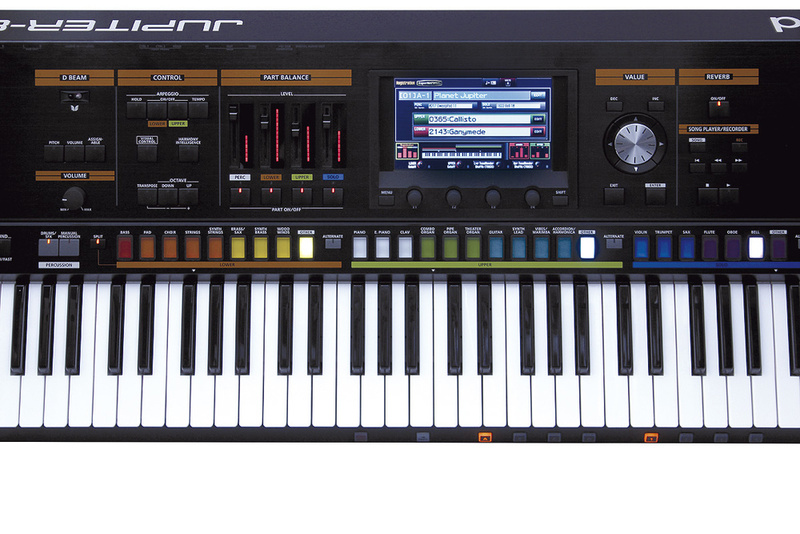 Resemblance to its ancestor aside, the Jupiter 80's large, colourful buttons and simple control panel make it especially useful for live performance. Let's start at the lowest level and look at the Supernatural Acoustic Tones. There are 117 of these, divided into categories such as pianos, basses, strings, guitars, and so on. A closer look shows that some sounds are presented in two versions, with the second prefixed by the letters 'APS'. Consequently, you have (for example) 0062:Oboe and 0104:APS Oboe, both of which sound like oboes but nevertheless sound quite different from one another. There's nothing to worry about here, although Roland seem to have got themselves into a bit of a semantic tangle when combining the Supernatural and APS technologies, because the literature also talks about something called Behavior Modeling Technology (the company's spellings, not mine) which, like APS, also claims to emulate the behaviour of a given instrument when you play its physical model. Are APS and BMT components of Supernatural Acoustic, or is Supernatural Acoustic the initial sound generator and are APS and BMT independent performance modifiers? Or is APS a component of BMT? Who shot JFK? Damned if I know! So let's turn to Supernatural Synth, where things should be simpler. Except that they're not. Indeed, I found the Synth mightily confusing until I realised that Roland's claim that the Tone is the lowest level of sound creation is wrong. I initially approached Supernatural Synth on that basis, but I got myself into a tangle because I wasn't differentiating between the controls that affect a Supernatural Synth Tone as a whole, and those that programme the three miniature synthesizers ('Partials') that comprise it. A Partial is a powerful synthesizer in its own right. Its oscillator appears to offer eight waveforms, but the six analogue‑type waves each have three variants, and pulse width and PWM are programmable where appropriate. The depth of the Super Saw (the seventh option) is also programmable, while the eighth option allows you to select any one of 380 PCMs that include many of the underlying waveforms from earlier generations of Roland's digital synths. There's also a dedicated AD pitch envelope, a ring modulator between Partials 1 and 2, and a waveshaper that can act upon any of the resulting sounds, whether Virtual Analaogue or PCM digital. Similar flexibility is apparent when you turn to the multimode (low-pass, high‑pass, band-pass and peaking) filter with its 12dB/oct and 24dB/oct slopes, and to the amplifier. There are even two LFOs, one for conventional duties, and a second dedicated to the modulation joystick. This is all good stuff, and a polysynth built on three of these (ie. a single Supernatural Synth Tone) would be a very powerful instrument in its own right. Largely eschewing the knobs and sliders of its forebear, the Jupiter 80's synth engine is accessed mostly via the 800 x 480-pixel touchscreen. Moving up a level, you can select any four Tones — whether generated by Supernatural Acoustic or Supernatural Synth — to insert into the four Layers in a Live Set. Strangely, this is also the level at which Tone editing (as opposed to Synth Partial editing) takes place, so before I can tell you about the facilities provided by the Live Set itself, I need to tell you about what it lets you do to the Tones that comprise it. Let's say that you want to layer a couple of Tones — one generated by Supernatural Acoustic and the other generated by Supernatural Synth — within a Live Set. To do so, you place the first in, say, Layer 1, and the second in, say, Layer 2 of the Set. (You have to do this when the Live Set is inserted within either the Upper or Lower Part of a Registration, but let's ignore that for the moment.) Now let's say that you want to edit the first of these Tones. Punching the appropriate Edit button reveals a handful of parameters that are relevant to the instrument in question, so, for example, the piano model offers control over string resonance, key-off resonance, hammer noise, stereo width, nuance and tone character, while the flutes offer noise level, growl sensitivity and 'variation', while the electric pianos offer just a single parameter: key-off noise. In contrast, the most complex of the models, the electric organ, is based on a Hammond generator with all nine drawbars, percussion, keyclick, leakage, and even subtleties such as the unusual behaviour of the 1‑foot drawbar correctly implemented. Frustratingly, there's no user memory for edited Acoustic sounds, so you can only save the modified Tone within the Live Set in which you edited it. I can see that this saves memory but if, for example, I want to create and store a range of Honky Tonk pianos, I can't do so except by using up Layers and Live Sets. Perhaps the reasoning was that there are so few parameters in a Supernatural Acoustic sound that any edits could be recreated elsewhere without too much hassle. Moving across to Supernatural Synth, inserting a Tone into a Live Set provides what looks like a complete set of synthesis parameters in addition to those found at the Partial level. However, these are not absolute, they are modifiers that override some of the values in the Partials (such as switching the filter type to a new setting) or provide offsets that affect the Partials' values. This is a weird architecture. The system is, in effect, treating the Partials as an 'expert' level, allowing novice users to regard Synth Tones as immutable building blocks and to tweak them into shape using the controls provided at the Live Set level. However, the advantage of this is that a Synth Tone moulded into a new shape in one Live Set is not affected when inserted into another, which is not a trivial benefit. Once you have inserted and, if desired, edited the Tones within a Live Set, you can apply effects and other facilities to them. On the surface, the effects section within a Live Set looks good, with four assignable MFXs (multi‑effects) offering 76 effect types, plus a global reverb. Unfortunately, the routing of the MFXs is fixed. While you can determine the level of the signal sent from each Layer to each MFX, to the reverb, and to the outside world, the four MFXs are permanently arranged in parallel, so there is no way to pass signal from one to the next. This means that you cannot send sounds sequentially through them to create (for example) an organ's effects path of chorus, reverb, overdrive and rotary speaker, or through common guitar effects paths such as compression, overdrive, EQ, chorus, and delay. I discussed this with Roland, whose engineer's response was, "we could make the routing more flexible, but this might have ramifications in other areas, so we should consider this carefully”. In other words: don't hold your breath. Notwithstanding this, the quality of the effects themselves is up to Roland's usual high standards, which is hardly surprisingly since many of them are augmented versions of the Fantom G effects, enhanced by the welcome addition of a three‑band parametric EQ. A Live Set also offers a variation on the concept of morphing from one patch to another. Called 'Tone Blending', this allows you to move from one state to another, with multiple parameters such as level, filter cutoff, resonance and effect send levels being affected simultaneously by a single knob or the onboard D‑Beam controller. You can define the start and end points of the transition for each of the Layers in the Live Set, which makes it possible to do things as simple as introducing a sound into an existing mix, as interesting as morphing from an Acoustic sound to a Synth sound and back again, or as experimental as turning civilised patches into over‑effected sonic mayhem. Then, if you stumble across something that you like anywhere within the blending range, you can save this as another Live Set, which is an innovative way to generate new sounds. The Jupiter 80's rear panel hosts all the connections you'd expect to see, and a couple more besides. A full list can be found in the 'Abridged Specification' box. We now come to the top level, the Registration. There are 32 of these (A‑1 to D‑8) in a 'Set', and eight Sets (called  to ), giving a total of 256 Registrations, each of which comprises the aforementioned four Parts — Perc, Lower, Upper and Solo — that can be played in isolation, layered in a variety of ways, or split into a maximum of four regions across the keyboard. If you want to change the whole setup at the touch of a button, this is the level at which it's done, using the buttons under the keyboard. Given that the Solo Part comprises just a single Tone, you simply insert the one that you want, determine the keyboard range over which it will play, and set up things such as its level, pitch and pan. The modifying parameters aren't as extensive as those provided by a Live Set, and the Solo Part's effects structure — which offers just compression, EQ and delay in series — is quite different from a Live Set's, so a given Tone can sound quite different when inserted and played here. If anything, the Perc Part is the weirdest of them all. With its Manual Percussion option selected, this sets aside the bottom 15 notes of the keyboard for a selection of percussion sounds. There are eight sound sets provided but, given the limited number of notes available, these are not laid out in conventional GM fashion. Alternatively, you can select the Drums/SFX option, which gives you access to 16 drum kits, either across the entire keyboard or limited to the region defined by the Lower Part. You can also insert any Supernatural Tone here, again accessible across the whole keyboard if no splits are on, or in the same range as the Lower Part. This can be very useful, although you have to remember that the Perc Part's editing and effects have the same structure as the Solo Part's. With more than a nod toward live performance, the Jupiter 80 offers two additional tools at the Registration level that can be applied to the Live Sets inserted into the Upper and Lower Parts. The first is a powerful arpeggiator. This can generate traditional patterns, with the usual parameters, such as octave range, rate and shuffle, but when you start to experiment with its Styles, Variations and Motifs, you'll find that it offers many more possibilities, encompassing everything from simple patterns to guitar licks and strums, walking bass patterns and more. You can even create up to 128 new 'User' styles by importing and saving Standard MIDI Files of up to 500 notes. The second tool is called Harmony Intelligence, and this adds a harmony to the topmost note that you play in the Upper Part, calculated from the notes that you play in the Lower. There are 17 types of 'intelligence', and these determine the nature of the harmonies that are generated. Names such as Big Band, Strings, Hymn, Country and Gospel tell you exactly what Roland's engineers had in mind, but while these would be appropriate for a domestic instrument, they seem a touch incongruous here. The Jupiter 80's MIDI capabilities are as extensive as you would expect, with independent input and output channels for each of the Parts, a separate control channel to change Registrations, MIDI sync, extensive MIDI CC capabilities, and the ability to transmit parameter changes as SysEx data. There's also an extensive menu for controlling external sounds, and this allows you to set up things such as velocity ranges and key zones for each of the 16 channels. In addition to this, the Jupiter 80 offers Roland's proprietary V‑Link protocol and is compatible with the new MIDI Visual Control specification, both of which allow players to control still images and video clips using MIDI note numbers and CCs. I would love to have access to this technology for my band's stage shows, but as I don't own a MIDI‑controlled video presenter or projector, I can only assume that this works as it should. Finally, the Jupiter 80 incorporates a USB‑based song player and recorder. Copy a suitable file (or files) to a USB drive and stick it in the USB slot on the control panel, press the Song button and you're ready to go. In playback mode, you can fast‑forward and rewind, loop within a file, chain files, alter the sound using the dedicated four‑band EQ, and perform karaoke‑style centre cancellation. You can also alter the playback speed and pitch, and although the algorithms for these functions are not state‑of‑the‑art, they are adequate. You can even record audio back onto the memory stick as 44.1kHz, 16‑bit WAV files, mixing your own performance with any audio being presented to the USB or analogue audio inputs. I like this player; it's simple and intuitive, and the independent speed and pitch controls will allow you to work out all those fiddly Emerson Lake & Palmer piano solos that have been bothering you for years [he's not kidding — Ed]. Nonetheless, I'm unimpressed by the repeated exhortation that one should, "never insert or remove a USB memory stick when the power is on”. Given that the same port is used for saving and backing up the Jupiter 80's memories, you would think that an 'eject' command and hot‑swapping would be taken for granted, not precluded with dire warnings of the sky falling in! The Jupiter 80's keyboard is very pleasant to play; a good compromise given the range of keyboard duties — from grand pianos, to organs, to orchestral imitations, to synth solos — that it will be asked to perform. I suspect that this is in part because the size and weight of the Jupiter 80 lends the keyboard a reassuring solidity, while the instrument as a whole still remains more manageable than most synths based on 88‑note piano‑weighted keybeds. This has to be a good thing for an instrument designed to spend much of its life on the road. What's more, the fact that the Jupiter 80 boots up markedly faster than a V‑Synth or a Fantom makes it more suitable for live use in at least one other sense: there must be nothing worse than standing on stage and telling the audience you'll start playing again in a few minutes once the keyboards have rebooted! Other things also suggest that Roland have thought carefully about on‑stage use, and the area in which this is most obvious is, perhaps, that of patch selection. 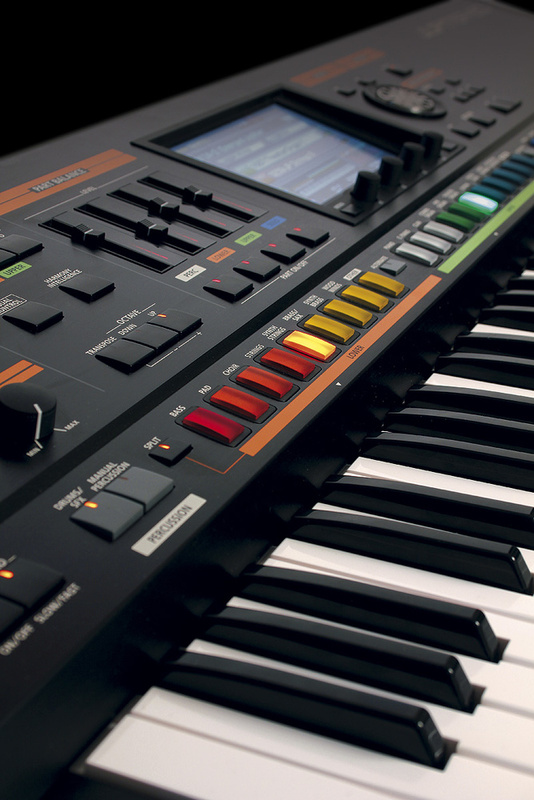 The 27 large, colourful buttons running behind the keyboard allow you to punch your choices from 54 predetermined Tones and Live Sets into the Parts of the current Registration, and the Tone Remain function holds any existing sound(s) until you release those keys, so there are no glitches on changeover. What's more, you can specify the Tones and Live Sets that are attached to each button, and you're not constrained to sounds that conform to their names, so the system can be very flexible. So now we come to the sound of the Jupiter 80. Starting with the Supernatural Acoustic sounds, I have strong suspicions that, rather than being a pure 'physical modelling' synth in the way that I would historically have used that term, Supernatural Acoustic is similar to Roland's Structured Adaptive Synthesis (SAS), which built its piano and electric piano sounds using parametric models derived from sample analysis. Given that a similar technology was recently used for the V‑Piano, I emailed Roland to ask whether I was correct and whether the piano sounds in the Jupiter 80 were the same as those found on other Supernatural pianos such as the RD700 and FP7F. I hit a corporate brick wall. The official response was, "we are unwilling to share this information”, and when I asked for a list of the behaviours that comprise Articulative Phrase Synthesis and Behavior Modeling Technology, I obtained the same answer. Nonetheless, the Jupiter 80 is, as Roland claim, a remarkably playable and expressive synthesizer, and many of its Supernatural Acoustic sounds — such as the superb Clavinets, the accordions and the excellent acoustic bass — are impressive, and the subtle but sometimes important performance benefits of BMT and APS shouldn't be overlooked. Let's take an example. If you select one of the acoustic guitars — say, 0035:SteelStr Guitar — and isolate this from all the other sounds, you'll find that you can play it conventionally and it will sound equivalent to patches from elsewhere. You could also switch on the 'Strum Mode', so that chords are strummed in a realistic fashion. But, again, this is nothing new. However, BMT becomes apparent when you play two notes, either one or two semitones apart, quite hard and almost simultaneously. You then hear a realistic glissando from the first note to the second. If the interval is any greater, you obtain a strum or a picked chord because BMT assumes than any interval above two semitones is fretted separately or played on a different string. Other easily audible examples of APS/BMT can be heard when you trill rapidly and slur brass sounds, but there are some Tones for which the effects are either so subtle that I'm missing them, or nothing is implemented. Unfortunately, given Roland's reticence to discuss the matter, I can't be any more informative. Turning now to Supernatural Synth, I can only restate how powerful the Jupiter 80 is in this department. You can stack three Partials in a Tone and up to 10 Tones in a Registration to create some monstrous patches combining analogue waveforms, Supersaw and PCMs! Or course, it's much more sensible to create useful Tones and then layer them in Live Sets to create some luscious sounds, but I suspect that the main question on everyone's lips is, 'does it sound like a Jupiter 8?'. As you might expect in a synth called the Jupiter 80, there are numerous Tones, Live Sets and Registrations called 'Jupiter 8 something or other', and a cynic might expect these to be nothing more than an appeal to the gullible. However, notwithstanding a touch of aliasing at the highest pitches, I found the Jupiter 80 to be capable of some remarkably good imitations of the old lady. What's more, these comparisons weren't against dim recollections of how a JP8 sounded when I heard one in a shop in Middlesbrough on a soggy afternoon in 1982... I placed my Jupiter 8 next to the Jupiter 80 and compared them directly. Of course there were differences, but in a blind test of some brass and string patches, I couldn't tell which synth was generating which. This was not what I had expected! Nonetheless, there is in my view one significant shortcoming in Supernatural Synth; while you can affect the loudness and brightness of a sound using aftertouch, you can't introduce vibrato, tremolo or growl. For a synth that prides itself on its performance capabilities, this seems a lamentable oversight. You may have expected that something bearing the Jupiter name would offer fistfuls of knobs and sliders, and a signal path harkening back to the heyday of analogue synthesis. The Jupiter 80 does neither. So should we conclude that its name and colour scheme are no more than a cynical marketing exercise designed to drag cash out of the wallets of the unwary? Certainly, it bears no more relation to a Jupiter 8 than a Juno Stage bears to a Juno 60, so it's easy to leap to this conclusion. But you must also remember that the Jupiter name only assumed its current cachet some time after the original series had been superseded by the JX8P and the Super JX10. In 1981, the Jupiter 8 was merely Roland's interpretation of the current state of the art, designed to compete head‑to‑head with the Prophet 5 and Oberheim OBX, so in the sense that the Jupiter 80 is a performance synth based on the latest technology, its name is not inappropriate. Nonetheless, it's going to continue to annoy a lot of people. Such issues aside, I'm relieved that Roland let me have the pre‑release Jupiter 80 for such an extended period, because at the start of this review I couldn't understand why they had designed such a strange synth. But, as I learned how to approach its Tones, Live Sets and Registrations, and as I began to work with what its effects structure could do rather than complain about what it could not, I started to discover what a remarkably expressive musical instrument the Jupiter 80 is. I also began to realise that, had it been manufactured elsewhere, somebody in the marketing department would have been bouncing up and down and proclaiming loudly the multiple physical models that comprise Supernatural Acoustic, whereas Roland have been commendably conservative in their lack of hyperbole. Of course, the Jupiter 80 is not for everybody, and if you need a workstation capable of providing a dozen splits with multitimbral effects assignments, you're looking at the wrong instrument. But if you're after something that provides some top‑notch piano and orchestral sounds, a remarkably powerful VA synth that can imitate the best of the real thing, and the ability to build these into complex, involving sonic structures, the Jupiter 80 has a lot going for it. Sitting somewhere between a preset stage piano/organ/synth and a fully featured workstation, it's a brave design, and — like me — potential purchasers need to take the time to overcome their preconceptions of what they think it should be, and begin to appreciate it for what it really is. I know of nothing that competes head‑to‑head with the Jupiter 80. There are therefore two alternative routes one could travel: down the technology slope to a stage piano/organ with more limited synthesis capabilities, or up it to a workstation that offers pianos, orchestral synthesis, virtual analogue synthesis, and no doubt much more as well. In the former case, the Clavia Nord Stage 2 SW73 suggests itself for anyone who wants excellent pianos, excellent organs that, if I am honest, are superior to the Roland's (due to the effects), but a simpler synthesis engine. In the latter case, you need look no further than the Korg Kronos 73 which, like the Jupiter 80, offers multiple physical models and virtual analogue synthesis, but a whole lot more besides. Strange though the Jupiter 80's architecture is, it's not new. In 1976, the Yamaha GX1 offered a rhythm section, a bass section, a Lower section comprising two parts, an Upper section comprising two parts, and a Solo section comprising one part, with the whole lot combined into a set of registrations selected by buttons found underneath one of its keyboards. What's more, the Yamaha's manual stated that, "What makes the GX1 truly unique is NATURAL sound.” (That's their capitalisation, not mine.) OK, so the GX1's sound is merely NATURAL rather than Supernatural, but you have to wonder who it was in Roland's development labs that swallowed Yamaha's old document library! It appears that Roland are not going to supply the full set of Jupiter 80 manuals on paper. A short introductory manual will be printed but, whenever something gets interesting, this will refer you to "the PDF manuals”. There will be two of these — a Parameter manual and a MIDI manual — and it appears that you will have to go to Roland's web site to download them. Unfortunately, neither was available at the time of review. Bah humbug! Roland launched the Jupiter 80 as, "a keyboard that represents a real step forward in realistic‑sounding and automatically expressive electronic musical instruments, just as the Jupiter 8 did when it was released back in 1981.” I still have the original Jupiter 8 handout printed in January 1981, as well as the subsequent Roland product brochures, and nowhere can I find it described as "realistic sounding”. In fact, Roland were keen to promote it as having "the sound sophistication of a modular synthesizer”. For this and many other reasons, I think that the Jupiter 80 would have more appropriately been named something like the 'Stage 80', and I strongly suspect that this would also have curtailed some of the criticism that has been levelled at it elsewhere. It's a solid, robust performance synth with a good keyboard and reassuringly large, friendly controls. It's a surprisingly powerful and capable VA synth. It offers some excellent acoustic sounds. It incorporates a useful audio player/recorder. It's compatible with V‑Link and MIDI Visual Control. It offers some unusual, performance‑oriented features not found elsewhere. The programming architecture is not well explained. The effects structure is not as flexible as one might hope. There's no memory for saving edited Supernatural Acoustic sounds. Its name. I fear that this will prove to be a handicap rather than a benefit. Its price, which puts it at the top end of the stage keyboard market. I wish that Roland had named this synthesizer the 'Stage 80' or something similar, because it's a very capable performance keyboard offering some unusual features and some great sounds. But the 'Jupiter' name could be a millstone, creating all manner of preconceptions that have to be eliminated before potential users can begin to appreciate it for what it is. In short: very interesting synthesizer, very poorly chosen name. If you're after a stage synth, check it out for the first reason, don't ignore it for the second.